Preheat the oven to 190ºC, gas mark 5. Place the pear and garden fruits into a 600ml shallow, ovenproof dish. Sprinkle with half the sugar. Sift the flour into a mixing bowl and rub in the butter until the mixture looks like coarse breadcrumbs. Stir in the remaining sugar and ground almonds. Scatter over the fruits dish. Top with the flaked almonds. Cook in the oven for 30 minutes until the top is golden and the fruit tender. Serve with warm custard. 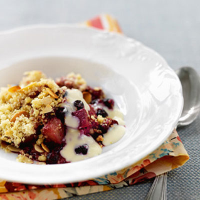 The remaining frozen fruit mix makes lovely compote to serve with Greek yogurt and muesli for breakfast. wonderful dessert wine, that has flavours of peach, citrus and vanilla: De Bortoli Noble One Botrytis Semillon 2006 New South Wales, Australia.